Kent Conservation District, in partnership with Rogue River Watershed Partners want local landowners to know about a “once in a lifetime conservation fund” that could significantly benefit their property, and the watershed, as well. “If landowners do not apply to use these special funds over the next few years, the watershed will miss out on significant financial help that can improve and sustain our water quality”, says Gretchen Zuiderveen, President of the RRWP. More than $2 Million is available over the next three years to qualified landowners in the Rogue River watershed (and in the Indian Mill Creek watershed) to help improve water quality in these watersheds, and beyond. • Where does this money come from? It came to this area through the Regional Conservation Partnership Program, an arm of the U.S. Department of Agriculture’s conservation service. Grand Valley Metro Council worked to co-ordinate with 22 partners in order to qualify for these competitive funds. • What is the purpose of RCPP? “RCPP encourages partners to join efforts with producers to increase the restoration and sustainable use of: soil, water, wildlife, and related natural resources…on a watershed scale”. • Why is this money focused on these two watersheds? 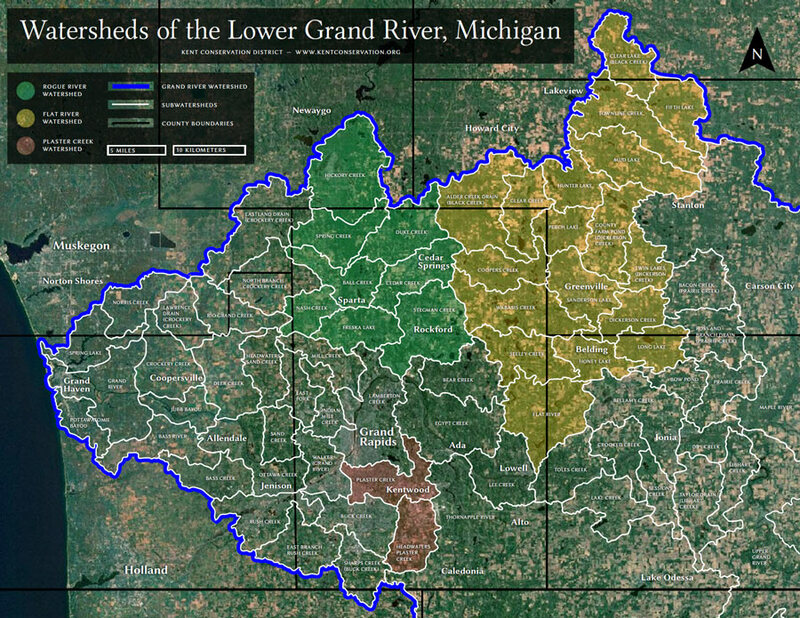 These watersheds play a vital role in supporting fish habitat and cold-water streams. By implementing the best practices listed below, the water quality of the Rogue River, will become more protected, and will supply healthier water to the Grand River and Lake Michigan, as well. • How can the money be used to improve water quality in these watersheds? It can be used as cost-share for conservation practices: nutrient management plans, cover crops, filter strips, forest stream buffers, erosion control structures, grassed waterways pollinator habitats, and forest stand improvements. If you want to find out if your property is eligible, call your local NRCS (National Resources Conservation Services) office today at: (616) 222-5802. The Rogue River Watershed Partners, along with staff from the NRCS, will be hosting information breakfasts in various communities throughout the Rogue River Watershed. Look for announcements in your local papers, on the Kent Conservation District or Rogue River Watershed Partners web sites,(rogueriverwp.org ) or FaceBook pages, for when and where to meet and eat. Open pdf in new tab for larger view and/or download.